I love summery totes! And not just for a beach day. A summer tote bag is the perfect casual summer anytime carry-all. I’ve been looking to buy myself a new one and there’s just too many adorable ones to choose from. Want to help me decide?! Soooo many “totes adorbs” totes!!!! And if my decision wasn’t already hard enough, I just found out all of these totes just went on sale at Nordstrom! A fun look from last week’s link up … Sarah of Sew Sarah R looks totally adorable in this striped jumpsuit! How’s your week going, Dolls? Mine has been crazy busy with the end of school madness … finals, grades, paperwork, graduation. But really looking forward to having more blog time soon! Important reminder: Nordstrom is having their Half Yearly Sale now through June 4th! Stay fun, stay fierce! Don’t forget to link up any style blog or Instagram post! Sign up for the Fashion Should Be Fun mailing list … a once a week dose of style, smiles & sale alerts! I can’t get enough of the fun totes this season! There are so many to choose from and more coming out everyday! They add such a festive vib to outfits! Peace! Adorabel Adorable, but not as ADORABLE as you!!! LOVE the tassels and Happy weekend babe! Totally need a fun tote like this, thanks for sharing all of these cute picks! Have a great weekend! It’s the fun prints that get me everytime!! I even included the photo of mine that I use for traveling!! 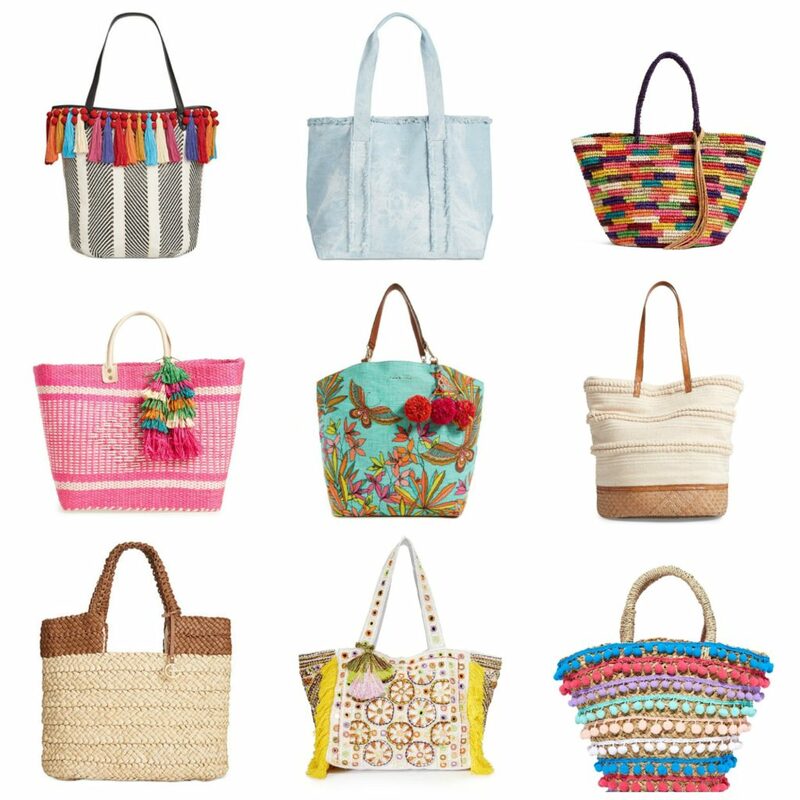 Love all of those totes! Can’t choose just one!! I love a cute summer tote, too! The Trina Turk ones are so fun! Thank you for hosting and wish you a fabulous weekend! I adore a summer tote! You have some fantastic choices – I’ve pinned a couple to my summer special in Pinterest. I love the one covered in pom poms. I’d be tempted with two. I’d go for one neutral to go with anything and one bright to go with neutrals. Oh well in my dreams. They are lovely and great investment pieces ultimately. I love all your picks! That pink one is my fave. All of these are perfect of the summer season. Thanks for the link up! Happy Memorial Day Weekend, Dawn. Thanks for the link up! Love all of your picks! My favorite is the tote with the butterfly and pom poms! Have a great weekend! The brighter and more colourful, the better! I have been seeing totes everywhere lately! My favorite is the solid pink one, but a neutral tote would go with anything. I love that these festive totes are so trendy right now! Love all of your picks, especially the one with the rows of pom poms! SO pretty! So many fun totes! I want them all! All these bags are so fabulous, I love the butterfly one the best, and Sarah looks so chic in that jumpsuit! those bags are so cute!!! love your picks!!! Love the ones you are showing. The neutral Macys bag and the Trina Turk are my favs! These are all so adorable I can’t even pick a favorite! These totes are all so cute! I love the ones with the tassels!